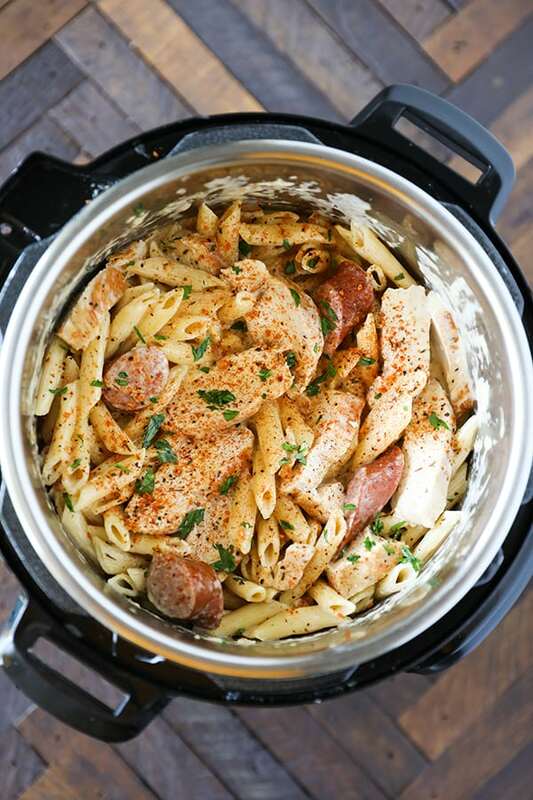 This Instant Pot Pasta Cajun Chicken Alfredo is packed with flavor, and so easy to make! 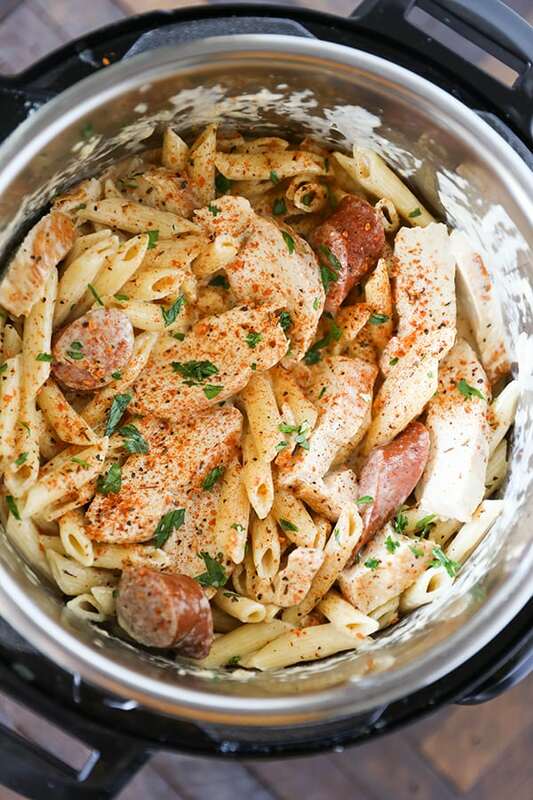 Cajun seasoned chicken breast and smoked sausage in a homemade alfredo sauce, cooked up in a snap in the Instant Pot. 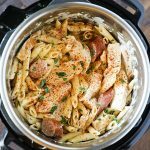 This is the Instant Pot Pasta version of one of my most loved reader recipes, my One-Pot Cajun Chicken Alfredo. 1. 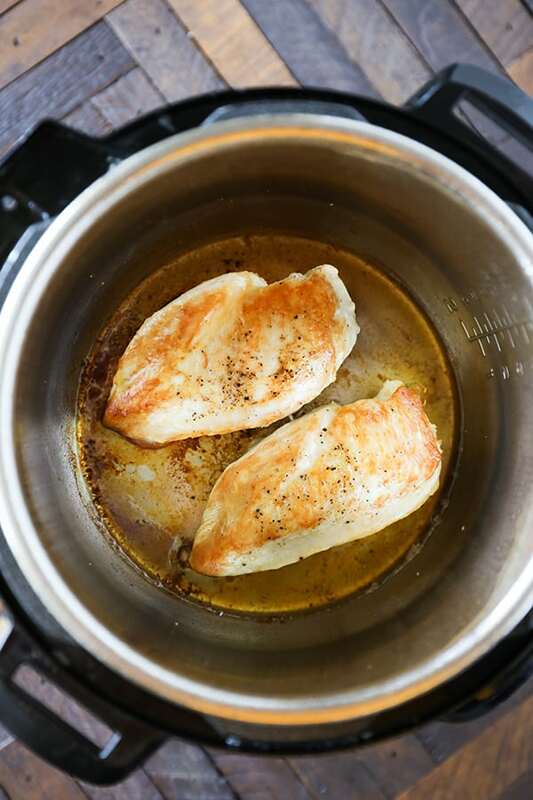 Start by browning the chicken breasts on the saute function, set to high. 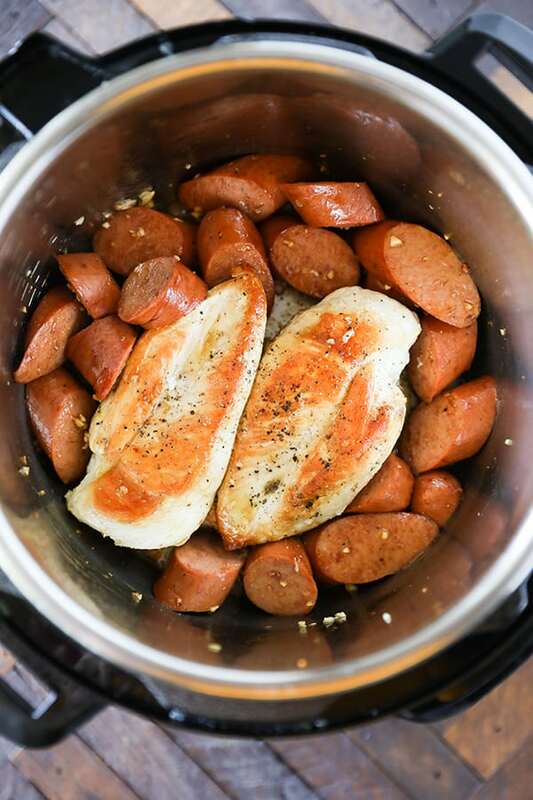 This will partially cook the chicken breasts and they will finish cooking in the Instant Pot. 2. Add smoked sausage and garlic. 3. 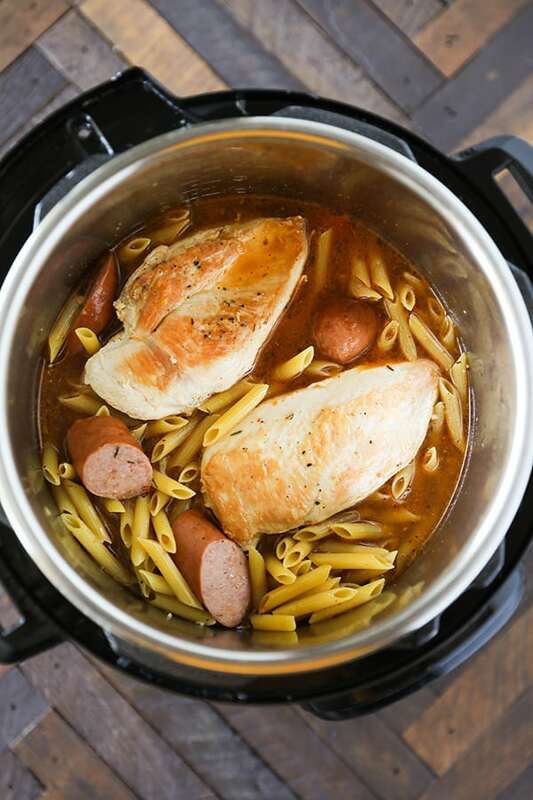 Add low-sodium chicken broth, pasta and cajun seasoning to the pot. 4. Close and lock Instant Pot lid into place. Set Instant Pot to Manual mode High Pressure for 6 minutes. Quick release and remove chicken breast, set aside to slice. Add warm heavy cream to pasta, followed by parmesan cheese. 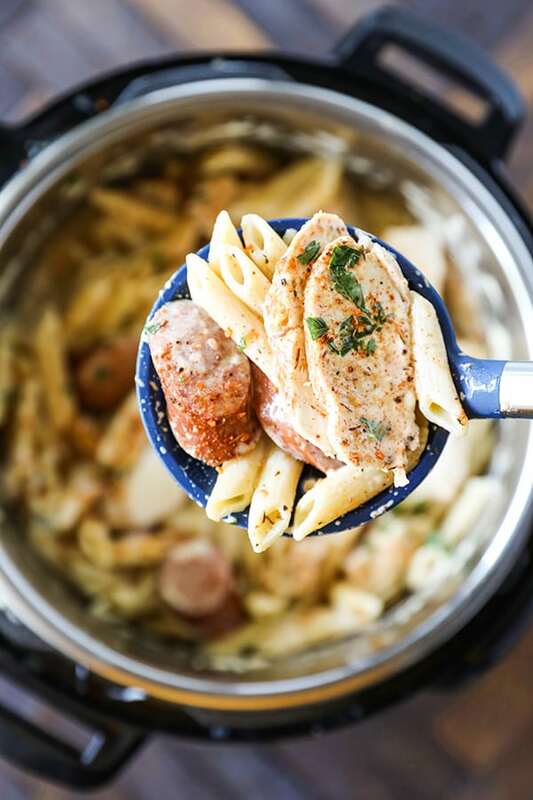 Stir sliced chicken back into Instant Pot pasta. Sprinkle with additional Cajun Seasoning and fresh flat leaf parsley. Use freshly shredded parmesan cheese for smooth melting. A microplane is the best tool for finely shredded parmesan cheese. Add warmed heavy cream after the pasta has cooked to avoid overfilling the Instant Pot and spray from the vent release. Use a gourmet cajun seasoning that is coarsely ground for best flavor. Add sausage and garlic to pot and cook for about one minute. Add uncooked pasta and cajun seasoning. Cook on Manual, High Pressure for 6 minutes. 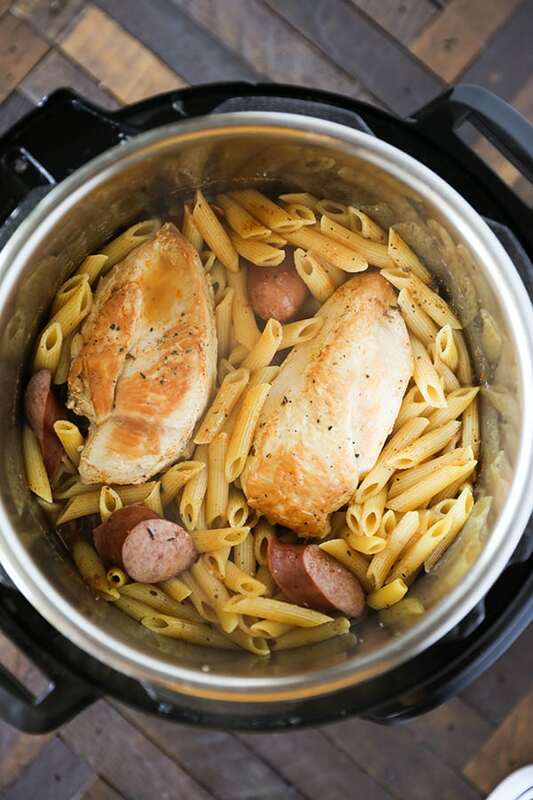 Instant Pot with take 10-15 minutes to come to pressure and then count down from 6 minutes. Stir pasta mixture together and add warm cream. Slowly add in freshly grated parmesan cheese and stir until melted. Serve with additional shredded parmesan and chopped flat leaf parsley. If i just wanted to use sausage and no chicken would i change the cooking time? Awesome, love these 10 minutes of prep recipe! Can’t wait to try this for the kids. Thanks! This was my very first attempt at cooking in my new IP, and it turned out great! Six of us ate it for dinner, and declared this recipe a winner! It makes a lot, plenty of leftovers. That’s great! So glad you enjoyed the Cajun Alfredo! Dish tasted good but my parmesan separated and was gooey. What did I do wrong? Did you make any changes to the ingredients? It’s important that there is enough fat in the sauce for the cheese to melt smoothly. That can also happen if you use bagged, pre shredded cheese as it has thickeners and doesn’t melt as well. Hope that helps! This turned out well. It didn’t thicken very well though. My only change is I added more seasoning and used pre cut chicken. I want to make this with shrimp how would I do that? I’m new to the IP community! I tried this recipe today and it was a huge hit! While sautéing the chicken, there was quite a bit of splatter. I used Old Bay seasoning and couldn’t be happier. This will be a regular in our kitchen recipe box. Thanks so much for sharing! This is our new favorite recipe! It was shared by a friend who made it for a pot luck and said she used mozzarella by mistake so that’s how we’ve made it and oh my goodness…. So so good! I look forward to trying it out with parmasan. Great recipe! Thank you! Loved this recipe and my husband is asking for it again a week later. My only complaint is there was still a ton of leftover chicken stock after cooking everything. Adding the cream made it even more soupy. I ended up dumping everything in a large skillet to boil down the liquid and add the cheese to make it thick. I followed the recipe to a T. Any ideas? ?